A new Automotive Industry customer made an enquiry to Hoist and Winch for the re-assessment of one of their lifting applications due to recent multiple failures. The customer has eighteen production stations on several production lines across two manufacturing facilities. Two site surveys were arranged and a full inspection of their existing equipment took place. During the survey work it soon became apparent that the existing hoisting equipment specified for the task was not fit for purpose. The existing hoist units being used were a low cost/low duty wire rope design without a mechanical rope guide. The operators were performing up to fifteen cycles per hour in a very fast paced automotive manufacturing environment, which was causing the wire rope to spool on the hoist drum incorrectly and resulting in load slip and danger to the operators. In addition the inadequate hoist unit, top limit switches fitted to the existing electric wire rope hoist units were sometimes failing as the operators continually worked the hoist units up to the top limit switch position. 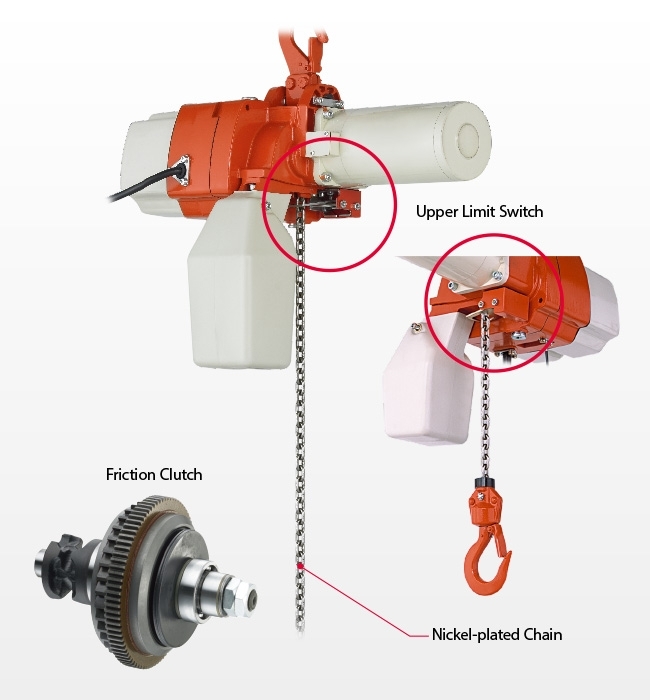 Failure of a hoist unit top limit switch is a very serious matter causing a hoist unit to work “block to block” and overload which can result in load chain or wire rope failure and had done so in this application on several occasions. Due to the urgency of the situation, Hoist and Winch very quickly re-assessed the lifting application requirements and specified that the application required a high speed single phase electric chain hoist with a SWL of up to 100kg, having a high duty cycle, slipping clutch overload protection and a heavy duty top limit switch. With numerous hoist manufacturer options on the market we were able to use our product knowledge and experience to select the 100 Kg Swl version of the Kito ED series range of hoist units. The Kito ED series electric chain hoist unit selected offers dual speed operation with a slow speed of 3 metres per minute for fine load positioning and a fast speed of 13 metres per minute for general use. The incredibly robust top limit switch fitted to this electric hoist unit as standard cuts off the power supply to the hoist motor when the operator engages the switch, this prevents a Swl overload situation/safety clutch operation and shock loading of the load chain resulting in safe operation and prolongs the life of the chain hoist load chain. Hoist and Winch put forward this proposal to the customer who very quickly decided to order two trial units. Within one week the trial had been a success, with feedback from their operators that they felt much safer when using the Kito ED series electric hoist, whilst it was also recognised that due to the speed of the new hoists the timescale of the manufacturing process was reduced, resulting in up to a ten second improvement in the manufacturing process cycle time. An order followed for a further seventeen hoist units including one spare unit. With all the electric chain hoist units installed and working well within their capability we have not been notified of a single hoist failure over a number of years which proves that taking the time to completely re- assess a hoisting application by an experienced Company such as Hoist and Winch is sometimes the best solution. Contact Hoist and Winch Limited for your special lifting application projects today.